Diamond Details: 314 Round brilliant cut white diamonds, of G color, VS2 clarity, of excellent cut and brilliance, weighing 1.37 carats total. Gemstone Details: 2 pear cut peridot stones, of exquisite color, weighing 4.42 carats total. Earring Design: Natalie K 18k rose gold design. 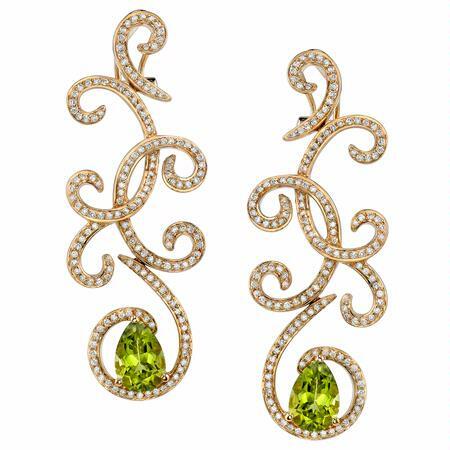 These gorgeous Natalie K 18k rose gold dangle earrings, feature 2 honeycomb pear cut peridot stones, of exquisite color, weighing 4.42 carats total with 314 round brilliant cut white diamonds, of G color, VS2 clarity, of excellent cut and brilliance, weighing 1.37 carats total. These earrings feature post and omega clips. Please call for pricing 1-800-790-6980 or 1-212-302-2863.